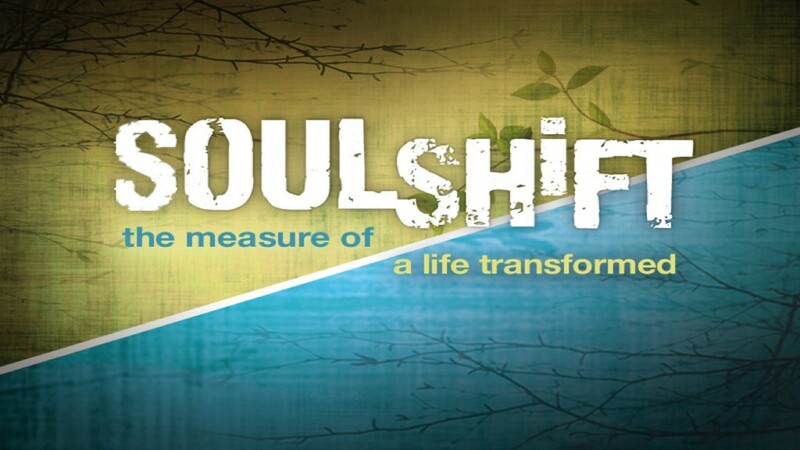 Today we begin a new series – “Soul Shift.” I thought the title expressed well a desire for transformation. We will be working our way through Matthew 6 – and other related passages (Luke 11 for instance). By next Sunday we will have a curriculum available for use to follow along. It will be able to be used in a Sunday School class, a bible study, or a community group. If you were here the last two weeks, we listened to theologian, author, and lecturer J. Edwin Orr talk about revival, and specifically revival in America – and its relationship to prayer. We are beginning – or returning, to some prayer initiatives here at SBF. On the first Sunday afternoon of each month we will gather for a concert – or concerted prayer. This afternoon from 4-5:30pm. I will be beginning to search out pastors prayer gatherings in and around Manchester to pray with them as well. Last week J. Edwin Orr gave us some perspective on the history of revival – particularly as it relates to New England. I think it’s important for us to be aware of our history here in New England. And in the last couple of our SBF e-NEWS that goes out during the week I have spoken of a sense that there is a “quiet revival,” taking place in New England right now. One New England pastor referred to it as a “gospel replanting” of churches. Both formerly liberal as well as moralistically fundamental churches are undergoing a gospel-centered transformation, which is much like what has been happening here. For most of us prayer is, without a doubt, the most difficult spiritual discipline to make good and consistent progress in. And, when we think about prayer it’s easy to feel very guilty very quickly. The bottom-line definition of prayer is that it is communion with God. I recently came across a way to think about and clarify the different aspects of prayer that I’d like to share with you – and we will come back to this over the coming weeks. Inward – Surrendering to God and aligning ourselves with God. We’ll be talking about this aspect more today – and next week. This is where we surrender ourselves into the sanctification process. Most of the first chapter of the Sermon on the Mount is devoted to a humble surrender and reorientation through owning our own issues and mourning over the effects of sin. Upward – Worshipful communion with God. We lift our hearts and hands in grateful surrender, adoration, and worship. The Father sent the Son. Some people go around the world as missionaries. Most of us are missionaries sent to neighbors, co-workers, family, friends, acquaintances who are not yet active, intentional followers of Jesus Christ. What we are aiming for in this series (and season of SBF’s ministry life) is for there to be a transforming shift in our soul (individually and collectively), so that prayer becomes more natural – and more normative. Sometimes, when we have a burden to pray or a strong desire to draw closer to God, things right away, seem to get harder and more difficult – so we tend to back off of prayer. We end-up thinking, or even saying: “God, You just do Your thing and I’ll do mine…” Then we don’t move into “extraordinary prayer,” we just stick to “ordinary” prayer. I don’t want to discourage you, but I do think that often times our circumstances will get harder before they get better when we lean into God – and into prayer. Realistically, we need to be prepared for this. Mostly God begins point out and put His finger on our idols – or functional saviors, which are all the earth-bound things we turn to, to quiet the longings or pain that is in our souls. In the Bible – and in prayer, we have a language of love, trust, holy fear, hope, seeking, and serving. These are terms describing our legitimate longings, our desires for relationship to the true God. Then most of us have a host of false loves, false trusts, false fears, false hopes, false pursuits, and even false masters. Dysfunctional family or marital systems are often idolatrous. The most destructive of these is the classic addict and enabler. Did you know you can’t have an addict if there’s no enabler? There are ingestive addictions – things like alcohol, drugs, or food. We ingest substances to satisfy the longs and cravings of our soul. 3. What are some religious idols? The most common is probably superstition, trying to earn God’s favor, or other forms of moralism. The human tendency is bent toward religion, which essentially sets up rules and regulations (i.e., moralism) and we keep them to earn our righteousness before God. This is exactly the “different gospel” that Paul addresses in his letter to the Galatians (1:6). In the same verse Paul expresses amazement at how quickly they have veered and substituted religion for the gospel. Religious practice can become our functional savior. While the Galatians struggled with abuses of legalism, the Corinthians struggled with abuses of liberty. Both are soulish expressions of religion and not born of the Holy Spirit. The antidote to both excessive legalism and excessive liberty is the gospel. What am I saying with all this talk of idolatry? If we want to learn how to pray, we must be prepared for life to get harder before it gets better. We must be willing for God to point out our idols – and then ask us to offer them up to Him. In the end Satan remains the enemy of our souls who wants to disrupt, discourage, distort, and divide (see Eph 6:10-12). Prayer is not a method to get what we want from God, but THE means of getting more of God Himself, of encountering God so that He becomes the primary object we desire – God becomes the end goal of our lives. Ps. 42:1 – As the deer pants for the water brooks, So my soul pants for You, O God. Anne Lamott, prayer is our real self trying to communicate with the Real. Richard Rohr, prayer is disrobing our souls before God. Someone has said that prayer is like good jazz – it is both structured and spontaneous; there is tempo, timing, and a key yet there is freedom to move around. Which Paul specifically addresses in 1 Corinthians. 1 John 5:14-21 (#14) Finale! As we close out 1 John (and as we prepare our hearts for Christmas) I would like to begin our study today be reminding us of the human condition…And I should warn you that it may get a bit turbulent as we prepare to land the plane. Prov 20:9 – Who can say, “I have cleansed my heart, I am pure from my sin”? Rom 3:9-12 — What then? Are we [Jews] better than they? Not at all; for we have already charged that both Jews and Greeks are all under sin; 10 as it is written, “THERE IS NONE RIGHTEOUS, NOT EVEN ONE; 11 THERE IS NONE WHO UNDERSTANDS, THERE IS NONE WHO SEEKS FOR GOD; 12 ALL HAVE TURNED ASIDE, TOGETHER THEY HAVE BECOME USELESS; THERE IS NONE WHO DOES GOOD, THERE IS NOT EVEN ONE.” All of us have one singular thing in common…our base commonality is that we are sinners incapable of righteousness. Rom 3:23 – For all have sinned and fall short of the glory of God. The NT authors invite us to bear in mind that God’s commands for us to be holy and love our neighbor, etc. are not there to show our ability, but to reveal our inability and to remind us of our continual dependence on the grace of God to do in us and through us what we cannot do (accomplish) on our own. Before we move into our text for this morning I am going to say something very difficult to you. I will say it because I love you and I want to be able to say at the end of my time here that, “I did not shrink from declaring to you the whole purpose of God” (Acts 20:27). The core issue with you and me is not that we sometimes DO the wrong things, the problem is we were born with something very wrong inside of us. We are born in a corrupted state of being. We were born with a sin infection. If your default mode is that you’re basically a good person who occasionally does bad things then you have not understood the Bible – or the Gospel. Here is what I want to say as we move into our text for this morning: There is good news…The gateway for ever increasing joy for you and for me is an understanding that surly we were brought forth into a state of inequity that surely we have a bent toward rebellion. Our joy and delight begin with embracing our depravity. The way to a sure hope is to embrace hopelessness…it seems counter-intuitive to us. Another way to say it is – the unlikely route to joy is repentance (Dan Allender, The Wounded Heart). Whether from the pen of Moses, Paul, or other biblical authors, “But God” appears in various forms hundreds of times in the Bible. To understand these two words as they are used in Scripture is to understand the gospel. James Montgomery Boice wrote, “May I put it quite simply? If you understand those two words—‘but God’—they will save your soul. If you recall them daily and live by them, they will transform your life completely.” “But God” marks God’s relentless, merciful interventions in human history. 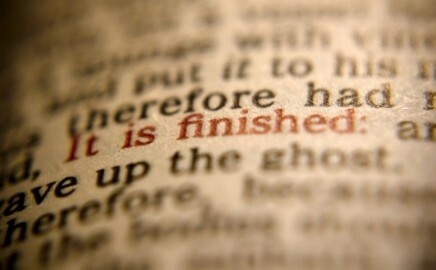 It teaches us that God does not wait for us to bring ourselves to him, but that he acts first to bring about our good. Without the “But God” statements in the Bible, the world would be completely lost in sin and under judgment. There are three main points in these final eight verses. In our remaining time, I’d like to go back and walk through them, viewing them in the light of the biblical truth – that we were brought forth in a state of rebellion and iniquity – and our only hope is God’s mercy and grace, which transforms us from the inside out. 1. Verses 14-17 – God loves (or longs) to give us what we pray for. This is the confidence which we have before Him, that, if we ask anything according to His will, He hears us. 15 And if we know that He hears us in whatever we ask, we know that we have the requests which we have asked from Him. 16 If anyone sees his brother committing a sin not leading to death, he shall ask and God will for him give life to those who commit sin not leading to death. There is a sin leading to death; I do not say that he should make request for this. 17 All unrighteousness is sin, and there is a sin not leading to death. So, the big picture assertion, or promise here is that God loves, or longs to provide what we pray for. John is saying that if we know that He hears us, then we know we have the answer (assurance). But did you notice a couple of elephants hanging around in those verses? James 4:3 teaches that prayers aimed at merely enhancing our own private pleasure will go unheard: You ask and do not receive, because you ask wrongly, to spend it on your passions. Elephant #2 – V. 16 – “There is a sin leading to death.” This verse has provoked widespread discussion. This is where the Catholics affirm their concept of mortal vs. venial sins. However, it seems clear that the one who sins unto death is not a Christian (although s/he my think they are). Here is what most scholars believe is the most likely interpretation: This is the sin of blasphemy against the Holy Spirit. The Pharisees committed this sin. And there are those whom John refers to earlier in 1 John as antichrists would also fall into this category. They were children of the devil, not children of God (3:19). Such sin, Jesus said would never be forgiven – in this life, or in the life to come. 2. Three Affirmations (“We knows”) John Stott calls them three clear, candid, bold, dogmatic certainties — which summarize the truths that have been shared in the earlier parts of the letter. The phrase “born of God” literally means “begotten” and indicates a new birth. If we have Christ, we have the power for deliverance from sin. This is what we are praying when we say in the Lord’s Prayer: “deliver us from evil” (Mat 6:13b). God remains the source of our spiritual life and being. We should not attribute to the “evil one” too much power. The word “lies” indicates that the “whole world” is but unconsciously asleep in the embrace of Satan. John draws a very clear and dogmatic line here: We are either 1) awake and “of God” (or in God), or 2) we are slumbering in the arms of Satan. There is no third category. This final affirmation is the most fundamental. Both redemption and revelation belong to God. And notice that the Christian is in Christ — sharing His very life. John has told us that Jesus is light (1:5), He is love (4:8), and he is concluding his epistle by saying that Jesus is the only true source of life itself (see also Jn 5:26). 3. The Concluding Exhortation — Guard [NIV, KJ: keep] yourself from idols (5:21). Keeping (tēreō) – Expresses watchful care and is suggestive of present possession. As in, Jesus Christ will – and is keeping us. Guarding (phylassō) – A helpful synonym for this v.21 word may be: beware. So, the NASB translation is a little clearer here. “Guard yourselves, or beware, of idols.” In other words, have a working knowledge or understanding (with accountability) of the areas where you attempt find comfort and joy in ways other than Jesus Christ. So, God keeps – and our responsibility, through sanctifying grace, is to be on guard, or to beware of idolatry creeping into our lives. In Christ we are empowered to find our joy, our comfort, our delight in Him. Sometimes our surface sins are only symptoms of a deeper problem. Underneath every external sin is a heart idol—a false god that has eclipsed the true God in our thoughts or affections. Some scholars would say we don’t really have a sin problem, we have a worship problem. In this context all sin is idolatry. And every time we choose sin we have chosen to find our comfort, joy, or delight in something (or someone) other than God. 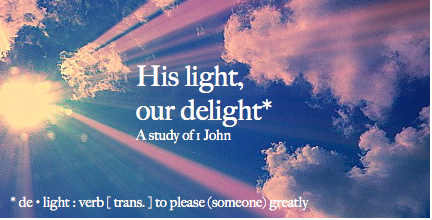 To sum-up: in our His Light, Our Delight study John leans in to an associated group of churches undergoing conflict to (re-) mold their concept of God and life within the church. By carefully describing salvation and its fruit in a Christian’s life, John brilliantly defines what a Christian is by clarifying the borders of our faith with the elements of light, truth, and love. John, an eyewitness to the ministry, death, resurrection, and ascension of Jesus – as well as His most intimate earthly friend, enables us to discern where we are in our lives and carefully sets our focus on where we could and can be as we press in to wholeheartedly love God and one another. A baseline for truth is seeking to understand the clearest concept of God, Jesus Christ, and humanity. Love is the way we imitate Christ in sacrificially relating to one other. His light is the reflection of holiness stemming from Christ dwelling in us through the sanctifying grace of the Holy Spirit – causing us to delight in what He has done. We wouldn’t want a Christianity without these three elements as John has defined them. It would no longer be what Jesus Christ taught and revealed to us. Because of this, we are exhorted to surrender to God’s transforming love and to love one another in ways that are consistent with how Jesus Christ revealed Himself to us. From a Catholic perception a mortal sin is a grave sin that ruptures our link to God’s saving grace. Stott, John. The Letters of John, Tyndale NT Commentaries Vol. 19, IVP Accademic 1964 & 1988: 192. We know that no one who is born of God sins; but He [Jesus] who was born of God keeps him, and the evil one does not touch him. A. We have been looking at what the Bible refers to as the Great Commandment, which is for us, important preliminary vision passage because it synthesizes so much of the Scripture into two VERY straightforward commands. Review of last week: How do we love God? Find your true joy and delight in the message of the Gospel – and the Person of Jesus Christ. Come to grips with the idolatry that grips ALL of our lives. (i) Idolatry is not just a failure to obey God; it is setting our heart and affections on something, or someone other than God. (ii) This cannot be remedied by repenting that you have an idol – or by engaging willpower to try and live differently. (iii) If we uproot our idols (through repentance) but fail to plant the love of God (or, delight in God) in its place, the idol will grow back – like mowing a weed. Repentance and rejoicing must go together. What is God’s heart/vision for Southside Bible Fellowship? The overwhelming commandment to “neighbor love.” Who is my neighbor? This passage retold in Luke 10 – and is followed by Jesus unpacking the Good Samaritan and Mary and Martha. John Piper: This is a staggering commandment. If this is what it means, then something unbelievably powerful and reconstructing will have to happen in our souls. It seems to demand that I tear the skin off my body and wrap it around another person so that I feel that I am that other person; and all the longings that I have for my own safety, health, success, and happiness I now feel for that other person as though s/he were me. Idolatry and pride are at the root of our sinfulness. Pride is the desire for our own happiness apart from God and apart from the happiness of others in God. Pride is the pursuit of happiness anywhere but in the glory of God and the good of other people. 1. Understand that our self-love is a creation of God. Jesus says in effect: I start with your inborn, deep, defining human trait—your love for yourself. It’s a given. Jesus is saying, I don’t command it — I assume it. We all have a powerful instinct of self-preservation and self-fulfillment. We all want to be happy, to live and love with satisfaction, we want enough food, we want enough clothes, we want a place to live, we want protection from violence, we want meaningful or important work, we want sincere and meaningful friendships, and we want our lives to count! All this is self-love. 2. Make your self-seeking the measure of your self-giving. When Jesus says, “Love your neighbor as yourself,” the word “as” is very radical: That’s a BIG word: It means: If you are energetic in pursing your own happiness, be AS energetic in pursuing the happiness of your neighbor. If you are creative in pursuing your own happiness, be AS creative in pursuing the happiness of your neighbor. If you are persevering in pursuing your own happiness, be AS persevering in pursuing the happiness of your neighbor. In other words, Jesus is not just saying: seek for your neighbor the same things you seek for yourself, but also seek them in the same way—with the same zeal, energy, creativity, and perseverance. The same life and death commitment when you are in danger. Make your own self-seeking the measure of your self-giving. 3. It’s the first commandment that makes the second doable. This is why the first commandment is the first commandment. If we try to accomplish the 2nd Commandment without FULLY engaging the 1st it will become the suicide of our own happiness. The 1st commandment is the basis of the 2nd commandment. The 2nd commandment is a visible expression of the 1st commandment. 4. Make God the focus of your self-seeking. Take all your self-love—all your longing for joy, hope, love, security, fulfillment, and significance—take all that, and take it to God, until He satisfies your heart, soul, and mind. What you will find is that this is not a canceling out of self-love. This is a fulfillment and transformation of self-love. Self-love is the desire for life and satisfaction rather than frustration and death. And with that great discovery—that God is the never-ending fountain of our joy—the way we love others will be forever changed. A. As we bring this to a close, we can say that our ultimate GOAL is to love God with all of our heart, soul, and strength – and the FRUIT is that we will splash His love onto people. B. God’s word for us this morning is that we embrace these commandments with tremendous focus and authenticity during this season of learning to express the redemptive love of God in and through SBF. C. Let these verses deeply touch and challenge your soul – and remake your priorities. D. Get alone with God and deal with Him about these things. 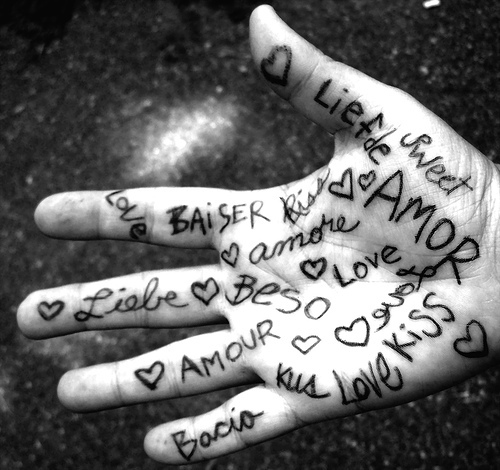 Let’s not assume that we fully know what love is – or that love has the proper centrality in our lives. E. God is saying: All of Scripture, all God’s plans for history, hang on these two great purposes: that 1) he be loved with all our heart, and 2) that we love each other as we love ourselves.